Have you ever wanted to control your computer just by looking at the screen? The technology to do this is relatively new. It has proved invaluable for people with disabilities and to help those without speech to communicate. But eye gaze technology has cost thousands of pounds and needed some training to use well. All this has now changed! “Inclusive Eye Gaze Foundations” now costs less than a thousand pounds, works with any of your current software, needs no training and will work with very young and developmentally young users. At this price it is set to bring eye gaze technology to every special needs classroom. A European partnership between German eye gaze gurus Visual Interaction GmbH (mygaze.com) and inclusion experts Inclusive Technology Ltd and has paired state-of-the-art eye gaze technology with carefully graded activities which can be used with anyone taking their first steps with eye gaze. 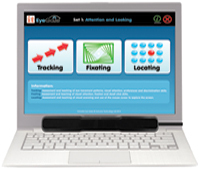 Inclusive Eye Gaze Foundations comprises the myGaze® eye tracker and Inclusive’s Eye Gaze Attention & Looking software. The myGaze assistive eye-tracking system is light, small and portable, yet powerfully offering performance and reliability – a product of 20 years of technological leadership in eye tracking. It works with any Windows mouse driven software and is easily accessible to everyone. The myGaze EyeMouse Play interface supports those new to eye gaze and all levels of ability – the easy one point calibration gives great functional accuracy. The Inclusive Eye Gaze Attention & Looking software takes users from the first experiential steps, through cause and effect to targeting and choice making. Students can learn to track, fix their gaze and interact with images on screen. Uniquely this technology also allows real-time recording of progress - you can play back and review where students looked and for how long via line trace, video and heat maps. Results and reports can be printed out too. “We have been looking for a partner to take this amazing technology into special education” said Daniel Trifonov of Visual Interaction GmbH “Inclusive Technology have a world lead in accessible software and we are excited they will be bringing the myGaze assistive system to schools around the world”. Inclusive Technology will distribute the Inclusive Eye Gaze Foundations package and the myGaze Assistive Gaze System through its distribution channels in the UK, Europe, Australia and the United States. In addition to its sixteen international resellers, Inclusive Technology has special education customers and contacts in 140 countries around the world who are already showing considerable interest in Inclusive Eye Gaze Foundations.